Let’s celebrate the official start of autumn with a beautiful little landscape by one of my favorite German expressionists: Emil Nolde. German expressionist landscapes were a big influence on my own painting when I was in school, so imagine my delight when I uncovered this little treasure while cataloging new image acquisitions from the awesome Albright-Knox Art Gallery in Buffalo! Nowadays, we are accustomed to abstraction in art. However, not even 80 years ago a lot of the public had trouble with abstract art. I totally do not understand how such a beautiful use of color could be considered offensive, but before World War II (1939–1945), abstraction was under fire in some parts of Europe as well as being shunned in America. Weird. Expressionism in northern European art of the early twentieth century was an offshoot of art movements in the late nineteenth century that emphasized romanticism, expressive color, or symbolic (rather than representational) subject matter. The objective in expressionist work was to impart the artist’s feelings about the subject and to elicit an emotional reaction from the viewer. Nolde is a unique figure among the expressionists. Born in northern Germany near the Danish border, Nolde initially studied woodcarving in Berlin. He studied painting in Munich, and eventually in Paris from 1899–1900, where he came under the influence of the colors of Impressionism. Armed with this bright palette, he returned to an intrinsically German style influenced by Gothic art, featuring emotionally charged subjects in bright color with jagged, often distorted forms. He urged other artists to reject some aspects of western tradition in space and form, and embrace art from non-western cultures, such as African masks and Oceanic art. In 1906 Nolde was invited to join the German expressionist group Die Brücke in Berlin, a group which Vasily Kandinsky characterized as expressing “inner necessity” in their painting. 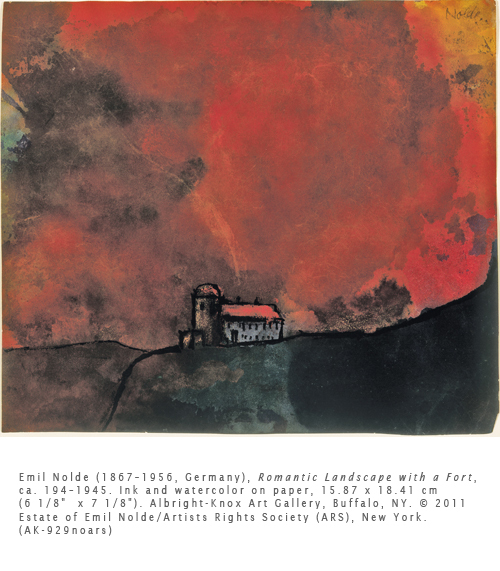 Nolde left the group a year later, preferring to follow a personal expressionist style. His works featuring figures reflected the influence of non-western masks, while his use of color was an exaggeration of the impressionist palette, and a reflection of the French Fauves’ use of non-local color on forms. This little landscape demonstrates Nolde’s love of his native land, expressed in the realm of pseudo fantasy. The brilliant color and vibrant movement of the surface are characteristic of his work throughout his life. Activity: Ask students to create a painting about a memory related to weather. Have them choose warm or cool colors to dominate the painting depending on the mood they want to show. I just read your entry now and I am deeply delighted by the way you make your blog post! Which methods do you prefer tell your readers that you have added a fresh blog article to this website?